It seems as though the world has gone mad. Yet, when we look at Scripture we see that when man, of his own freewill chose his own way over God's way in the garden, mankind began to devolve, not evolve. Evil and sin and wickedness entered this world right along with man's decision to rule His own life instead of submit to God's leadership. When horrible things happen, people often question why God allowed it. It's hard to wrap our mind around senseless loss of life and acts of terror and violence. The freewill of man is to blame, influenced by satan, not our good, good Father. There will come a day of vengeance, a day when God deals with the wickedly rebellious who refuse to repent and turn to Him. There will come a day when He makes wrong things right in this world. Meanwhile, He waits, He pleads, He woos, longing for just one more person to come to repentance. I believe that when the very last one that He knows will do so turns to Him, then He will turn to His Son, (the Son that is right now firmly seated on His throne in heaven in spite of how shaken and ugly things look right now on this earth), and He will say, "Now is the time Son, the time of the restoration of all things. Go and make the kingdoms of the earth Your Kingdom, My Son. Rule on the throne of Your father David as I promised long ago. " Our warrior King will come again. He will deal with those who refuse to repent. He will avenge the blood of the martyrs. He will rule this earth in righteousness and justice. He said He would, and He is not a man that He can lie. Oh Elizabeth. Good true words!!! Amen & Amen!!! What would we do in these turbulent times without God's Word to sustain and encourage us? Yes, God is sovereign! This morning our equipping class was studying Ecclesiastes. All things under the sun (life on earth) can be confusing. But the final note is that God is faithful and just. 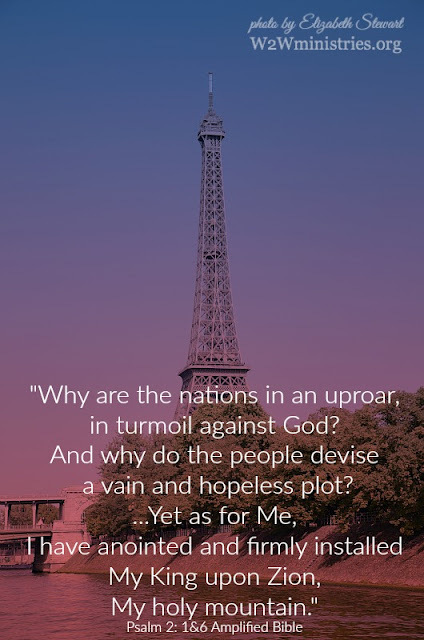 We can pray that the people of France will turn to the Lord in their grief. Yes, He is faithful and just and we can rely on Him! Yes, Elizabeth - he is not a man that he can lie - what a powerful turn of words! Praying that the Holy Spirit wash through France - and that revival will awaken a movement of faith! Amen. I agree with you in prayer. Yes, our God is on the throne. He is the same today as he was yesterday & will be tomorrow. His words are truth & what we can count on in an ever changing world. His love is always there waiting for any that want to turn their heart to Him. One day restoration will come to this earth again with the return of Jesus. Praying that the lost sheep will turn back before that day comes. Yes, we should be praying for people to come to Him! It does seem as if the world has gone mad...wise words Elizabeth. Our only hope is that many souls will turn towards Christ and away from the evil one. Everyday day the unimaginable just keeps coming. I am joining in to pray for the unsaved. Addie, what the enemy means for evil God uses for good as we all step up the prayers! The horrible things that happen in this world are so heartbreaking, and I try to remind myself it's because people have made evil choices. God is still so good and so faithful. I don't think we could endure if it wasn't for Him. Thank you, Elizabeth for reminding me God is still on His throne. May He give peace and healing to all those who are hurting! Trudy, I agree! May His peace and healing come! Oh my heart Elizabeth! That you were there and took this photo. Your steadfast soul standing on the ground that Jesus won for us. Sweet encouragement.